New year, new little bundles of joy on the way! Here's a list of celebs who are due to give birth in 2019. If there is anything parents to a baby can relate to, it's poop. Cardi B has been sharing what she hates about parenting her baby girl, and we'd say she's right on track to becoming a momsplainer. OPW presenter Kayise Ngqula recently welcomed her first child and now she is sharing a special message to all moms-to-be. Men using the term "we're pregnant" when their partner falls pregnant has become more and more popular, but it also seems to have become equally as, well, annoying. Expectant mother Andrea Allen from Arizona, US was filmed throwing jabs and kicks while in labour in her bedroom. WATCH: Have you heard of the famous salad that makes you go into labour? Romaine, watercress, walnuts and gorgonzola, topped with a balsamic vinaigrette, have the power to induce labour? Apparently. These moms swear this salad made them go into labour hours after eating it. We know what you did last summer – top months South Africans are making babies! 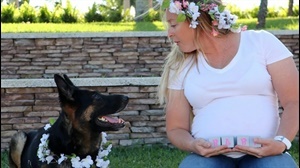 Forget grand pregnancy announcements, maternity photoshoots and gender reveals, the way this mom is celebrating her fourth pregnancy might become the latest trend on the parent-to-be block. A first-time mom spent an hour perfecting her make-up, while having contractions, only to pause when the pain became too severe. When his wife challenged him to experience pregnancy for 24 hours, Chris Balmert created a makeshift pregnancy suit, strapped it to his chest and went forth. Needless to say, he didn't conquer.